One early Saturday morning, I took off for a day out by myself. Soothing music filled up the car while I was driving. Once, in my life, I had loved taking long drives and listening to good music. It's therapeutic to drive on endless roads without any destination. Music and space worked together in massaging my overwrought nerves and mind. I'm a woman, a typical one, and on a quest for therapy, I opt for some therapeutic shopping. I headed straight to the produce market to start my day with freshness and colors. I took home more than what I needed but it caressed my soul. My good find: bunches of turnips and the sweetest clementines from Calabria. Next stop, the centro commerciale, otherwise known as the mall. On the way there, I saw a truck parked on the side of the road selling fresh produce from the south. Potatoes, clementines, pineapples (should be imported from South America) and oranges. Just what I needed. I was laden with oranges, clementines, vegetables & other fruits from the market that I deliberated whether to get a sack of potatoes too or not. I couldn't because I was too many kilos heavy to weave my way back to the car. Now, I had it easy. Park the car, the vendor puts the sack in your car and you hand over the money through the window. I've never heard of a drive-through market but it was not a bad idea. The mall. I went straight to the bookstore to immerse myself in the cookbooks I had been hoping to check. I love books but I don't remember the last time I was able to hold a book in my hands and actually read it from cover to cover in a span of days. It usually takes me years, months, if I'm lucky to finish one. Oblivious of the time, I spent a couple of hours browsing through the large number of books around. I narrowed down my choices, which wasn't easy believe me. I was very excited about Donna Hay's Stagioni (Seasons). I know it's from 2009 but to go to a bookshop and be actually able to choose and scan the books I'm holding is already short of being miraculous to me. 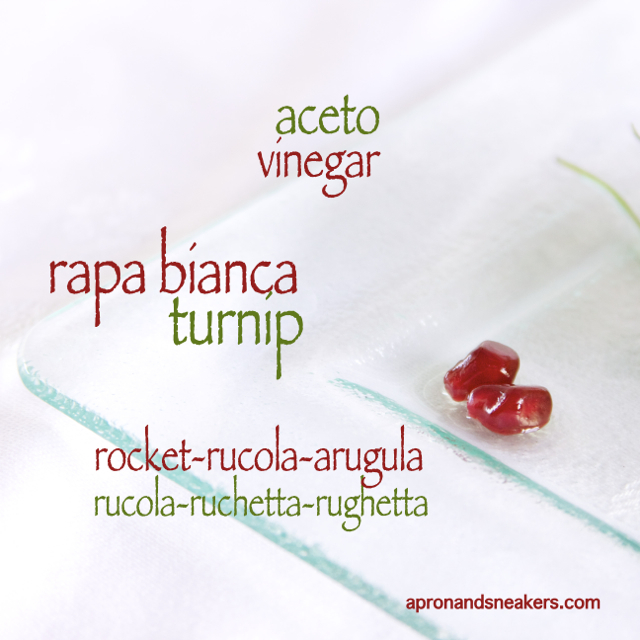 My other interesting find was the purely natural cooking by Italians Daliah Giacoma Sottile and Nicola Michieletto's La Cucina dei Colori (The Kitchen of Colors). 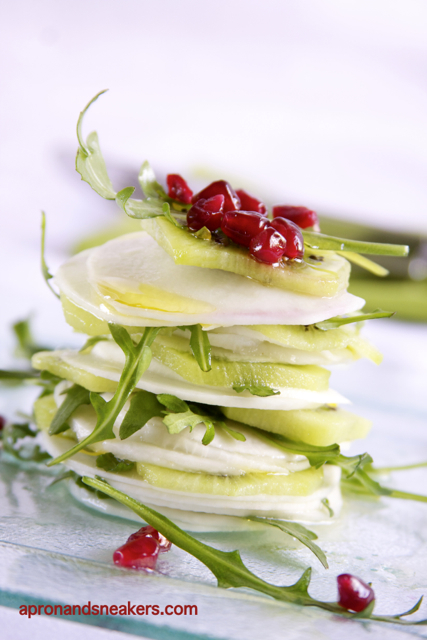 The other two are about cooking for kids, Il Cucchiaino d'Argento which has really healthy and good recipes for kids and Annie Riggs' In Cucina con I Bambini (In the Kitchen with Kids) which has wonderful ideas on kid-friendly food. Recharged, I pulled up a dish that reminds me of silence. It's like a wisp, light and fresh. A salad with its roots from my memories of childhood when I would chop some turnips and dress them with vinegar, sugar, salt & pepper. 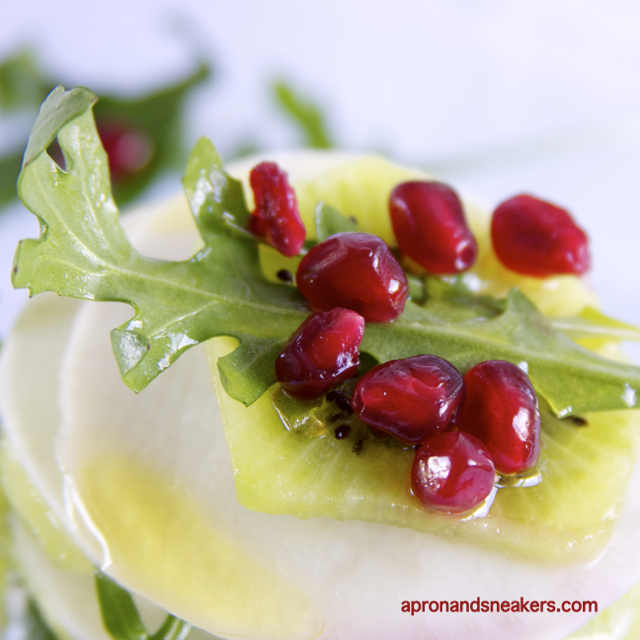 Adding a twist of kiwi, rucola and pomegranate makes it fruity and fresh. 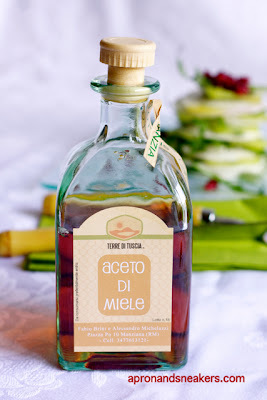 Dressed by my new addiction, aceto di miele (honey vinegar) made it even more delicious. The first time I saw a stacked up Waldorf salad was in a blog recently at the internet. I fell in love with its composition immediately. While browsing through my Donna Hay cookbook, it jumped out at me. It was there! Inspired, I stacked up my salad too. In a small bowl, whisk the vinegar, honey, salt and pepper. When the honey has melted, whisk in the extra virgin olive oil. Set aside. 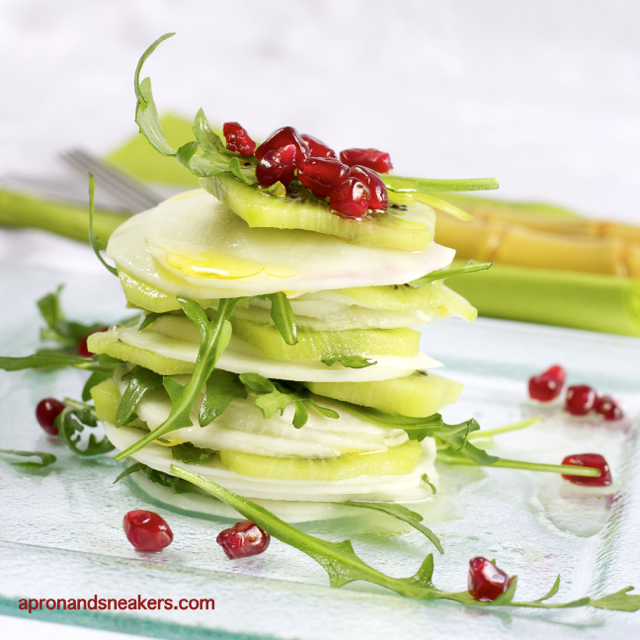 Slice the turnips and kiwi thinly with a mandoline or a knife. 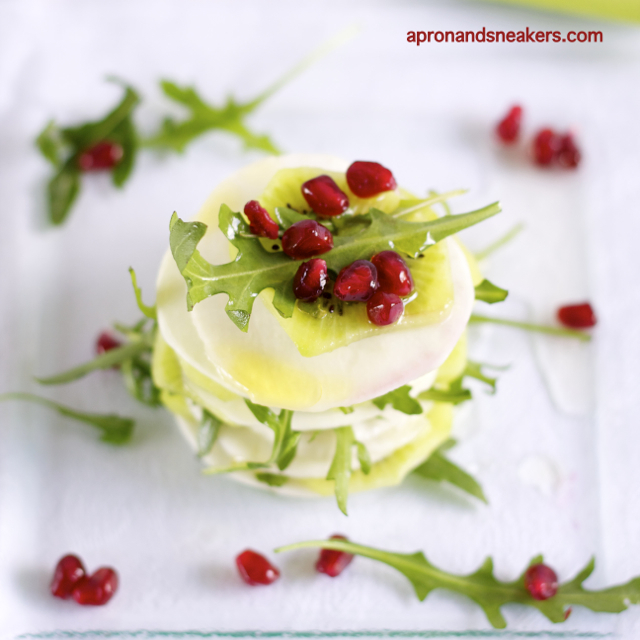 In a medium bowl, combine the turnips, kiwi, arugula and the dressing then mix carefully. Leave for 15 minutes. 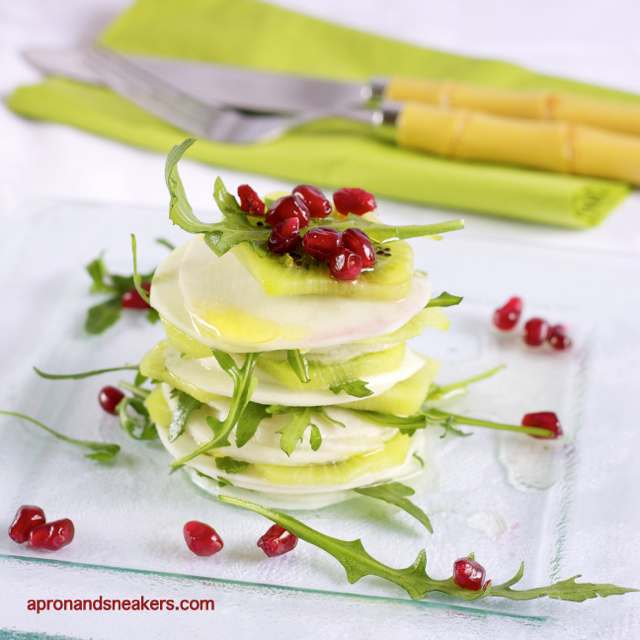 Stack the ingredients on a plate with the dressing the sprinkle the pomegranate.